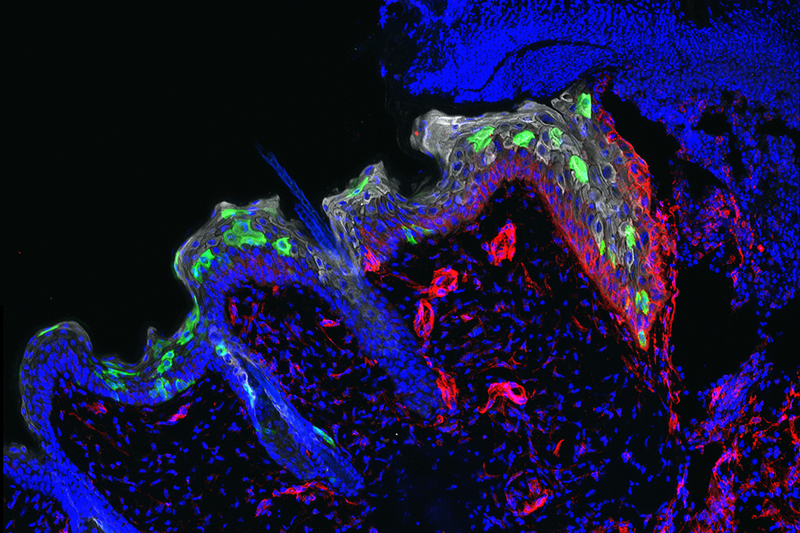 Stem cells (green) migrate into a three-day-old wound to repair it. Scars may fade, but the skin remembers. New research from The Rockefeller University reveals that wounds or other harmful, inflammation-provoking experiences impart long-lasting memories to stem cells residing in the skin, teaching them to heal subsequent injuries faster. These stem cells, which replenish the skin’s outer layer take their cue from inflammation, the body’s own response to injury or infection. The first bout of inflammation sensitizes these cells: the next time they sense it coming on, they respond more rapidly. This research, described October 18 in Nature, provides the first evidence that the skin can form memories of an inflammatory response—a discovery that senior researcher Elaine Fuchs says could have major implications for better understanding and treating a range of medical conditions. Whether burned by the sun, attacked by microbes, nicked by a paper cut or worse, the skin quickly becomes inflamed—red, swollen, and painful—as the body seeks to halt the damage and initiate repair. It has long been known that the immune system maintains a memory of inflammation to mount faster responses to recurrent infections. But scientists in the Fuchs’ lab suspected that other types of long-lived cells might similarly remember inflammation. Skin was a logical place to investigate: as the body’s protective barrier, it endures frequent assaults. It quickly became apparent that most of the cells in the skin’s outermost layer, the epithelium, don’t stick around long enough to form such memories. Instead, they migrate up through the epithelium and eventually slough off. Deeper within the epithelium, however, reside the stem cells that are responsible for continually replenishing it. These stem cells remain in place long after the skin has recovered from inflammation; and as the team found, this experience changes them. In experiments with mice, Shruti Naik, a postdoc, and Samantha B. Larsen, a graduate student, showed that wounds closed more than twice as fast in skin that had already experienced inflammation than in skin that had never been damaged—even if that initial inflammatory experience had occurred as long as six months earlier, the equivalent of about 15 years for a human. Healing sped up, the team determined, because the inflammation-experienced stem cells were better at moving into the wound to repair the breach. In other experiments, the researchers uncovered the basic mechanisms that rewire these cells. They showed that inflammation triggers a process that physically opens up distinct sites within the cell’s chromosomes, making certain genes accessible for activation. Some of these sites remain open long after the skin has recovered, allowing the genes to be turned on faster during a second round of inflammation. A gene called Aim2, which encodes a “damage-and-danger” sensing protein, appeared particularly crucial: an initial bout of inflammation prompts a sustained increase in its expression. A second assault quickly activates the protein, resulting in the production of an inflammatory signal that boosts the stem cells’ ability to migrate into the wound. Inflammation can sometimes run amok, as happens in autoimmune diseases like psoriasis, a disorder marked by scaly, red patches that often flare up repeatedly in the same spot. The new results suggest the skin itself could contribute to this recurring reaction. But in fact, the implications go more than skin deep. The team’s findings may also be relevant to inflammatory disorders that affect other parts of the body, such as the linings of the gut and bowel, which, like the skin, are replenished by epithelial stem cells. “Inflammatory diseases have long been blamed on immune cells that turn against the body. However, that is clearly not the only cause: Stem cells may also be important contributors,” Larsen says. And because the healing capacity of stem cells diminishes with age and goes completely awry in cancer, reprogramming through inflammation may have significance for these conditions as well. “A better understanding of how inflammation affects stem cells and other components of tissue will revolutionize our understanding of many diseases, including cancer, and likely lead to novel therapies,” Naik says. Fuchs investigates the molecular mechanisms of skin stem cells, how they make and repair tissues, and how cancers develop.